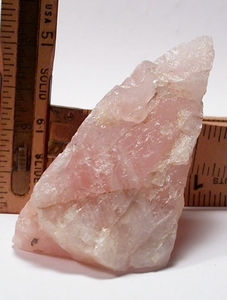 Milky quartz attractively stripes this spearhead shaped South Dakota rose quartz rough of pale translucent pink. Naturally sized to make a fine oversized pendant, easy wirewrapping. Triangled at 1-1/2x 1-1/2x 3" long with rainbows.